HUNTINGTON BEACH, Calif. — Jan. 18, 2019 — XXIO®, a global leader in premium lightweight golf equipment, introduces the all-new XXIO Prime, easy distance and easy accuracy for moderate swing speed golfers. The new XXIO Prime officially launches in North America on March 1, 2019. The new XXIO Prime Woods feature a redesigned hosel structure and reduced stiffness at the tip of the driver shaft, making it easier for moderate swing speed players to shut the face at impact for longer, straighter drives. Also, the new XXIO Prime Woods are lighter, making them faster while still remaining extremely easy to swing. A new forged cup face, made from Super-TIX® PLUS Titanium, is thinner, lighter and stronger for maximum COR across the entire face for more ball speed and enhanced distance. · Super-Tix Plus Forged Titanium Cup Face: Forged from Super-TIX® PLUS Titanium, a lightweight yet high-strength alloy, the new Cup Face greatly increases distance performance thanks to a hotter sweet spot that’s noticeably larger than the previous model’s. · Unprecedented Lightweight Construction: The SP-1000 Shaft, with TORAYCA® T1100G carbon fiber and NANOALLOY resin, is strong yet extremely lightweight. That, along with weight savings in the grip and club head, produces woods that are remarkably fast and remarkably easy to swing. · Groundbreaking Forgiveness Features: With an expanded toe and narrowed heel, a tungsten-nickel inner weight that is low and deep, a lighter hosel repositioned closer to the center of the face, and finally, reduced stiffness at the tip of the shaft, this is our most forgiving suite of XXIO Prime Woods. 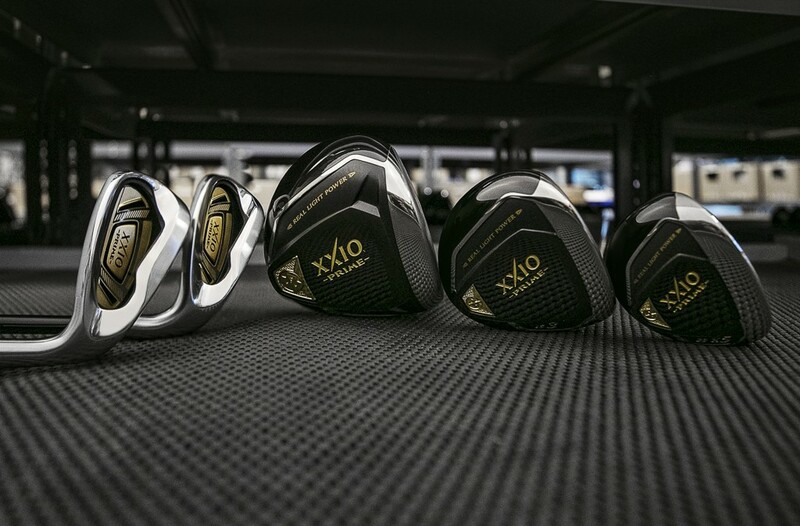 Reach more greens in fewer shots with new XXIO Prime Hybrids. With an expanded COR across the face, a lower center of gravity, and a straighter ball flight, Prime Hybrids greatly enhance distance and ball speed from anywhere on the course. Meanwhile, stick it close with new XXIO Prime Irons, providing more distance, more stopping power and a higher launch. Featuring a forged Super-TIX® PLUS Titanium face and CNC milled Speed Grove, new Prime Irons increase ball speed across the face for easier distance and easier accuracy. · Forged Maraging Steel Cup Face: Forged from Maraging Steel – a lightweight yet high-strength allow – the new Cup Face in the Prime Hybrids greatly increases distance performance thanks to a hotter sweet spot that is noticeably larger than the previous model’s. · Super-Tix Plus Titanium Face with Speed Groove: Made from Super-TIX® PLUS Titanium – a lightweight yet high-strength alloy – the new iron faces also feature a CNC milled speed grove that greatly increases COR for a larger, hotter sweet spot that improves ball speed for enhanced distance. · Unprecedented Lightweight Construction: The SP-1000 Shaft, with TORAYCA® T1100G carbon fiber and NANOALLOY resin, is strong yet extremely lightweight. That, along with weight savings in the grip and club head, produces hybrids and irons that are remarkably fast and remarkably easy to swing. · Groundbreaking Forgiveness Features: With an expanded toe and narrowed heel, plus a crown step that moves weight low and deep, this is our most forgiving suite of Prime Hybrids. Similarly, with two high-density tungsten nickel sole weights and an overall profile that is 3mm shorter than the previous model, this is our most forgiving suite of Prime Irons. XXIO Prime officially launches in North America on March 1, 2019, at a MAP of $259.99 for a single graphite iron, $379.99 for the Prime Hybrids, $579.99 for the Prime Fairway Woods and $849.99 for the new Prime Driver. For more detailed information on all of XXIO’s offerings click here.